Comprehensive information about Jón Arason including biographical information, facts, literary works, and more. 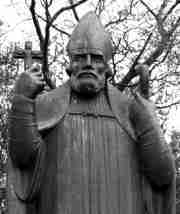 Jón Arason was an Icelandic Roman Catholic bishop and poet, who was executed in his struggle against the imposition of the Protestant Reform in Iceland. This educational Jón Arason resource has information about the author's life, works, quotations, articles and essays, and more. Articles about Jón Arason or articles that mention Jón Arason. Here are a few random quotes by Jón Arason.